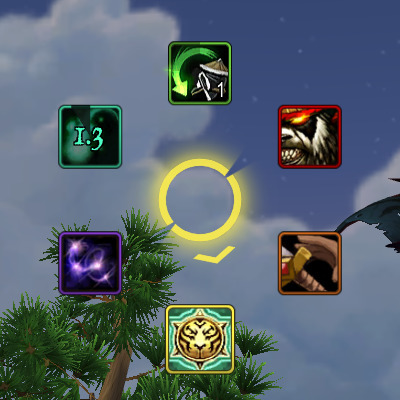 Middle-clicking on slices to open nested rings is broken in Vanilla 8. There are no errors that are being shown and this happens both with and without any other addons. 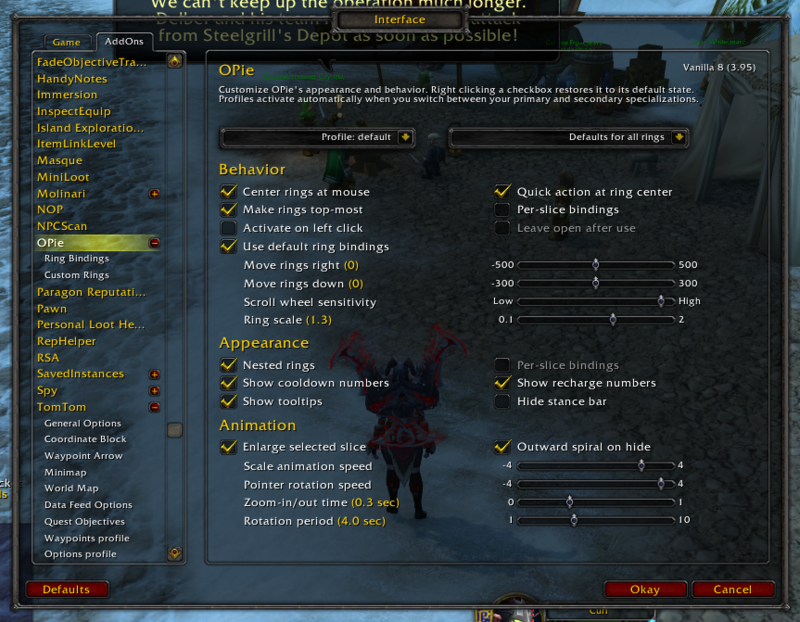 Unchecking Make rings top-most under Behavior in /opie options mitigates this. Unselecting Make Rings Top-most did not solve the issue for me. All it does is close the rings. I can't reproduce that; it would be helpful to know more about the combination of options and bindings involved. That does seem to fix the issue. Does the option just change the FrameStrata of the rings? Other than typing out all of my settings what can I do to provide you with the information you need? 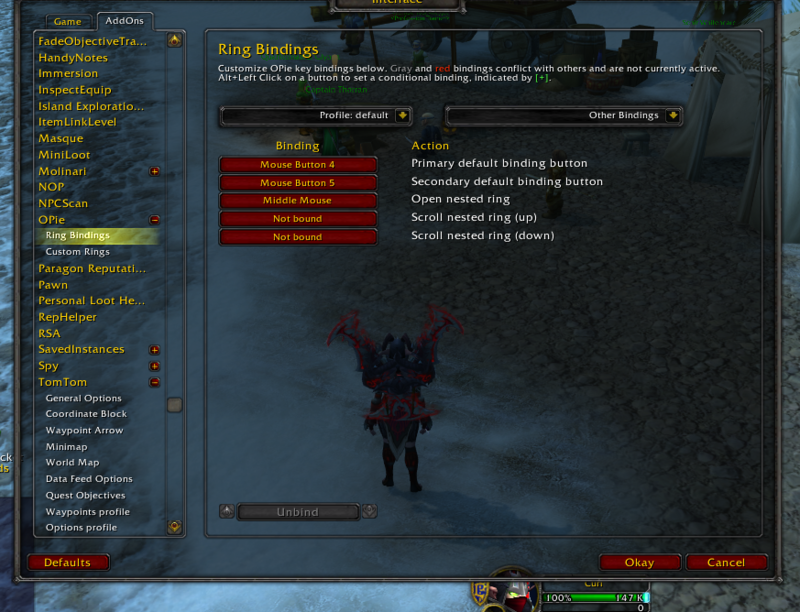 For me unchecking Make Rings Top-most did resolve the issue. Thanks. remember the active / valid keybinds come up white. Not quite, but the result is similar. The problem that this option tries to solve is that while you can register bindings for the mouse buttons, these bindings will not fire if the mouse button is clicked over a Button widget (instead, that widget's OnClick script handler fires if the widget is registered as interested in that button). When the option is enabled, OPie covers the entire screen with a single transparent button (with an almost-on-top-of-everything framestrata), and attempts to handle mouse button clicks directly. Unfortunately, this involves having to resolve "The middle mouse button was clicked!" to "The 'Open nested ring' binding was triggered" (or "The binding for 'Ring B' was triggered"), and V8 gets the order of some of the involved checks wrong, so the "Open nested ring" binding never wins. You can attach the World of Warcraft\WTF\Accounts\SOMETHING\SavedVariables\OPie.lua file to this ticket. I'm primarily interested in the state of the checkboxes under the behavior section of the OPie options, as well as anything else that might be bound to the middle mouse button. I can reproduce the issue where the middle mouse binding for 'Open nested ring' doesn't get triggered if the Make rings top-most option is checked (as in Jordaldo's settings screenshot); unchecking the option should remedy this in V8 (and I think I have a reasonable fix for this for the next release, so if this workaround works for you, no further information is required). I cannot reproduce the behavior where with Make rings top-most unchecked, clicking the middle mouse button doesn't trigger the 'Open nested ring' binding and instead closes the ring. This should be fixed in V9. Yup everything is working now even with the option enabled. Thanks again!